This paper describes an exploration of Monmouth County property tax records I conducted following a property revaluation in the Fall of 2012, which I, and many of my neighbors, believed grossly inflated property values. I hoped that the County records might reveal a flaw in the revaluation that would make it possible to argue for lower valuations. Failing that, I hoped that they would at least supply authoritative data that would enhance understanding and confidence in the revaluation. I limited my work to just a study of the County records. There are several other areas that would be interesting to explore including the revaluation process itself, how comparable sales were selected and used, the statistical significance of the size of the dataset, and the broader question of whether fair-market valuations are an equitable way of apportioning municipal costs. These were all beyond scope and the time I had available for this. Thomas Edison once responded to a question about 10,000 failed attempts to make a light bulb: "I have not failed 10,000 times. I have successfully found 10,000 ways that will not work". Well, I haven't quite tried 10,000 approaches in this study but I have learned a lot about the assessment process and properties values and assessments in Little Silver and neighboring towns that's not going to make one bit of difference in home valuations. When I began this study I was hoping to find a smoking gun, a gross mistake, a typo, something that would explain the huge increases that my neighbors and I saw in our revaluation. From all the data I have reviewed and charted and from all that I have learned my tentative, and hesitant, conclusion is that I can find nothing in the County data to dispute the revaluation but insufficient data to support it. Then again, I might have missed something. There is a lot of data here, a lot, to quote Arlo Guthrie, of eight by ten color glossy photographs with circles and arrows and a paragraph on the back of each one, or so to speak. And so I'll present the data I came up with for your own review. Perhaps you will see something I missed. Perhaps you will find the data useful for further action even though it didn't reveal the problems I was seeking. If nothing more, I hope you find it an interesting presentation of municipal data in a form that was not previously available. There is a lot to read here and I'd be deceiving myself if I thought everyone I send this to will actually get through the whole thing. So here are a few interesting factoids up front that I hope will encourage you to read a little further. 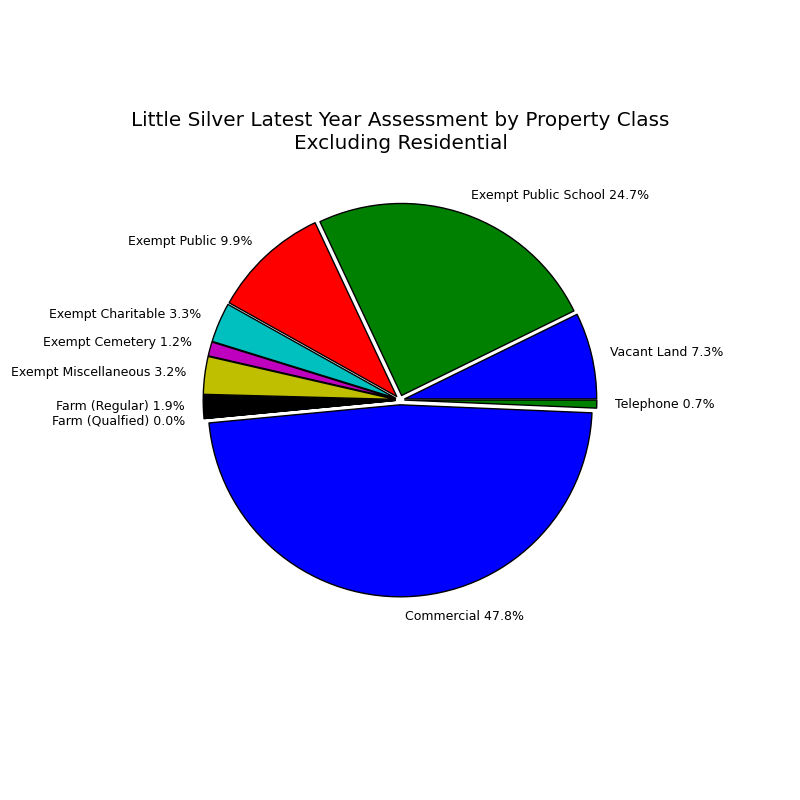 The average assessed value of all properties in Little Silver in classes 1, 2, 3A, and 3B went up by 7.40% between 2012 and 2013. 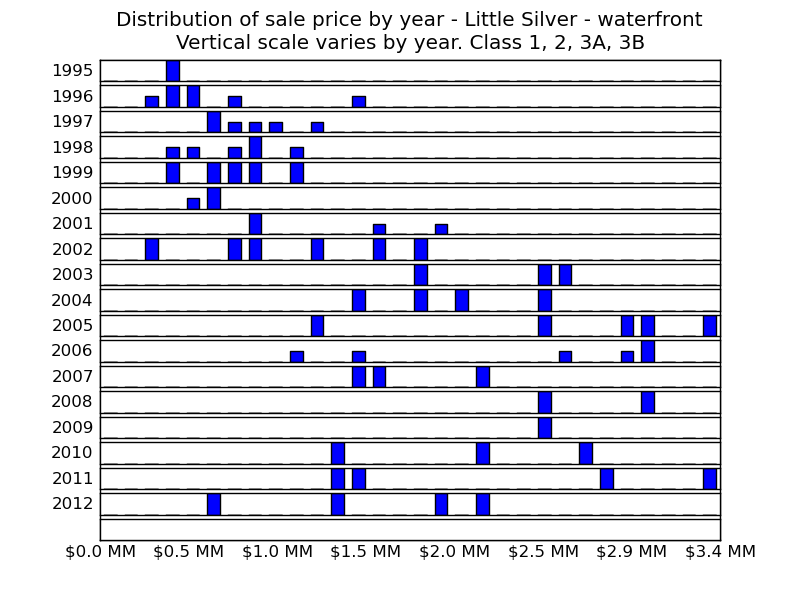 The average assessed value of waterfront Little Silver properties the same classes and period went up by 8.73%. There is a total of 2599 properties in Little Silver, 2523 of them are in non-exempt property classes, and 100 of them are on the waterfront. 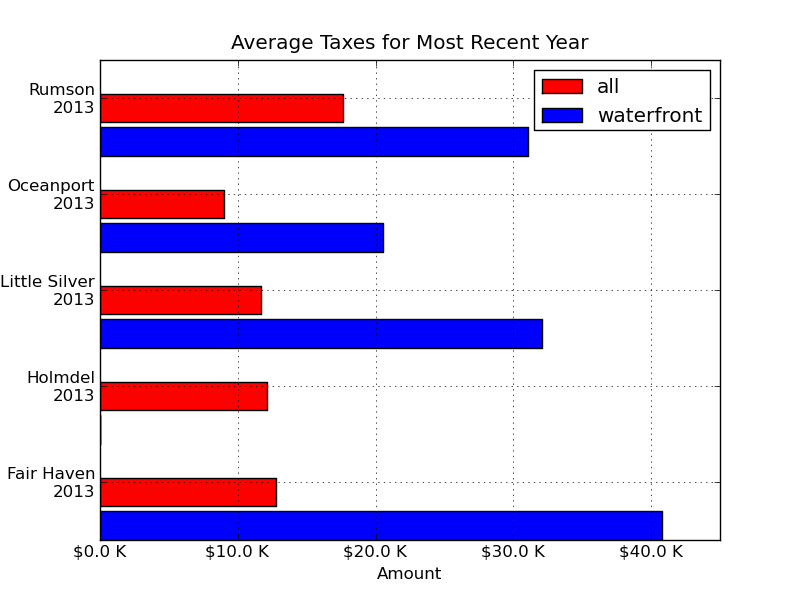 Waterfront properties represent 3.96% of non-exempt properties but pay 10.77% of the taxes. The assessment of the top 1% of non-exempt properties is 3.96% of the total assessed value. The assessment of the top 10% of non-exempt properties is 25.3% of the total assessed value. 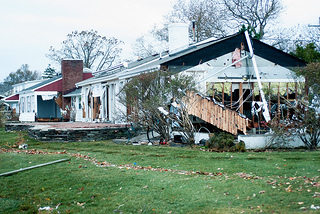 Hurricane Sandy impacted properties in Little Silver in a couple of ways. 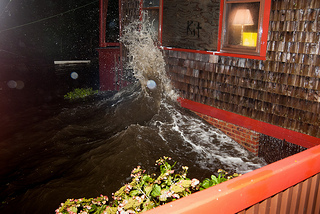 First, obvious, and quantifiable is the physical damage from flooding and wave action. The 2013 assessments used in this study reflect a temporary reduction in the value of improvements for impacted properties. In some cases the value declined to zero when the house is expected to be demolished. These are noted in the Mod-IV report. 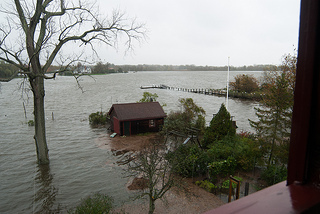 Far more difficult to quantify is the potential overall decline in the market value of Little Silver homes, especially on the waterfront, because of the potential for future flooding, uncertainty of flood insurance costs, uncertainty of building or rebuilding height requirements, and so on. It would be interesting to look at sales figures following the 11 December 1992 storm here and following other storms elsewhere but that data is not readily available and so this study includes no consideration of these factors. A revaluation of all properties in Little Siver, NJ, was done in the fall of 2012. While there was much folklore surrounding the reason for this including a drop in the Assessment Sales Ratio or Director's Ratio below a magic threshold of 85% or thereabouts, the best explanation I have heard was directly from Tax Assessor Steve Walter - that the prior assessment was ten years old. Time, not a ratio threshold triggered it. The revaluation numbers were first revealed in lated December, 2012, in a letter from Realty Appraisal Company, the firm contracted by Little Silver to perform the appraisals. These numbers were outrageous - the total value of my (120-year-old and far from pristine) house went up by 41% - others also on the water reported increases of 60% or more. And there was more folklore indicating an average increase of 25% for all of Little Silver. These numbers appeared inconsistent with perceived reality - the overall decline in house values as reported by media, a large inventory of unsold homes, and the asking prices for recent offerings compared to known sales of similar properties ten years ago. There was a lot of anecdotal evidence but little hard data. To remedy this I wanted to have a look at two things, actual sales numbers, preferably from an authoritative source, not Zillow, Realtor.com, or other real estate sites, and the actual revaluation figures, not just the highest ones, the ones stimulating the most conversation. At the outset I didn't know exactly where this was headed and I certainly didn't know what to expect. Despite the lack of a clear direction useful insights can often be revealed by poking around in data, by comparisons, by averaging large sets to small. It was in this spirit that I set out. Since a comparison of our numbers with other towns may be interesting also I include data for our waterfront neighbors Rumson, Fair Haven, and Oceanport, and a socioeconomically similar, non-waterfront town, Holmdel. This analysis looked at two data sets for each town. The SR-1a file contains a record for each sale going back many years. Not all sales are usable for assessment purposes (sales of convenience, between family members, less than $100, after foreclosure, etc., a total of 33 types). These were excluded in the work here when appropriate. The Mod-IV (Current Owners/Asmt List) contains a record for every property in the municipality - land, residential, commercial, and exempt. It is a snapshot in time and includes assessment data for a total of four years starting at the current. This include data for all property classes (vacant land, residential, farm, commercial, municipal, railroad, etc.) both non-exempt, taxable properties and exempt, non-taxable ones. The property classes used are noted in the various graphs and reports here. Both of these data sets are available at the Monmouth County Web Site. At the time of the mailing of the first letter from Realty Appraisal the only revaluation data available to residents was for our own individual property. Realty Appraisal would not reveal the complete list (which, I should add was paid for with taxpayer dollars). That data became available from the County shortly before the final postcards were mailed. It would have been helpful to have that data early, before dispute resolution and certification, to at least get a hint of what the averages looked like and how our preliminary revaluation compared to our neighbor's. Assessment data going back more than four years is not available in bulk form from the County web site. I have requested it, received an indication that I may be able to get it but so far, I have not received it and I doubt that I will. 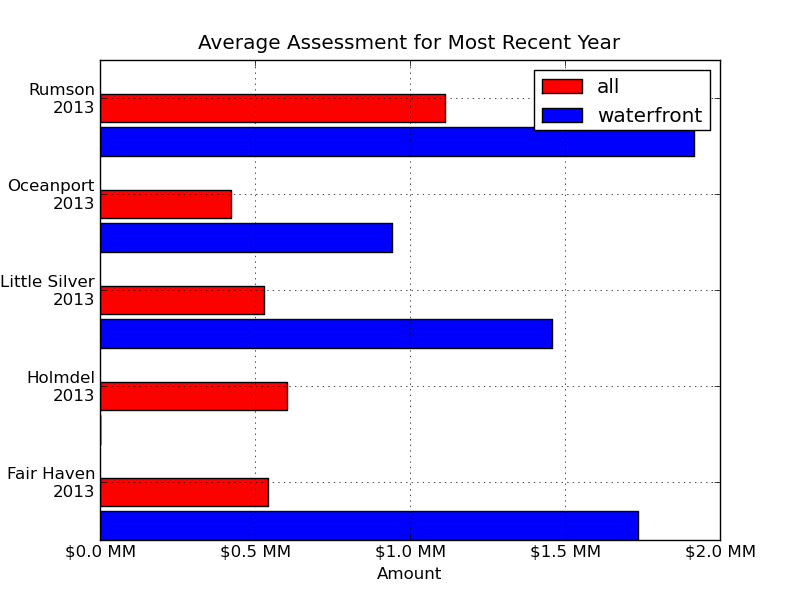 Unfortunately, neither the SR1a or the Mod-IV data distinguishes waterfront properties. Since this was important to this work I made a list of every waterfront property in the four waterfront town by inspection of the town tax maps. I got the ones for Little Silver at Borough Hall and the remainder from the Monmouth County Tax Map Archive. The Little Silver paper maps were more readable than the scanned images and I double-checked them on a return visit. I have a high degree of confidence in these; less so for the remaining towns which really should be double checked against the paper maps. Unfortunately, I'm out of time. In most cases I've used the deed date and calendar year for classifying sales. This is slightly more natural and intuitive than the fiscal year (July 1 -> June 30) and recording date used by the County. Because of this the data is not directly comparable to that used in the computation of the Director's Ratio and Coefficients of Deviation. The purpose of this study was not to duplicate the County ratios and equalization tables - I'm confident they are done correctly according to statue. Where I did compare results with County numbers they were close but to do any better would require running this analysis software on the identical data set as used by the county (difficult, since it is constantly changing) and probably algorithmic refinements not applicable for my objectives. I did use fiscal year and recording date when exploring the effects of data smoothing with a two-year average of the sale price as that more closely matched County algorithm. This study produced 38 graphs and 13 text files for each of the five included municipalities plus several summary images. I'm including only a subset of the graphs in the discussion here along with links to a few others and some of the text reports. Samples of the remaining graphs and text reports and a full list of all of the graphs and reports in included at the end. What is my house worth? That is the question that revaluation attempts to answer. There is one, and only one, sure way answer to the question - sell your house. That will yield a correct answer but it comes too late to be useful for revaluation purposes since you no longer own the house. (Valuations don't change at the time of sale - only when improvements are made or the whole town is revalued.) Absent an actual sale of your house the revaluation process attempts to infer the value of your house from the sale price of other people's houses. Let's have a look at some sales data. The following figures show average sale price and assessed value of properties sold by year for all properties and just waterfront properties. These are based on deed date, not the recording date, for calendar year, not fiscal year, and without two-year averaging. Also included are sales volume graphs. A couple of things stand out here. First, there is very little increase in the price for all properties in the ten-year period from the beginning of 2003 to the end of 2012 and there was a significant decrease in the price of waterfront properties in the same period. 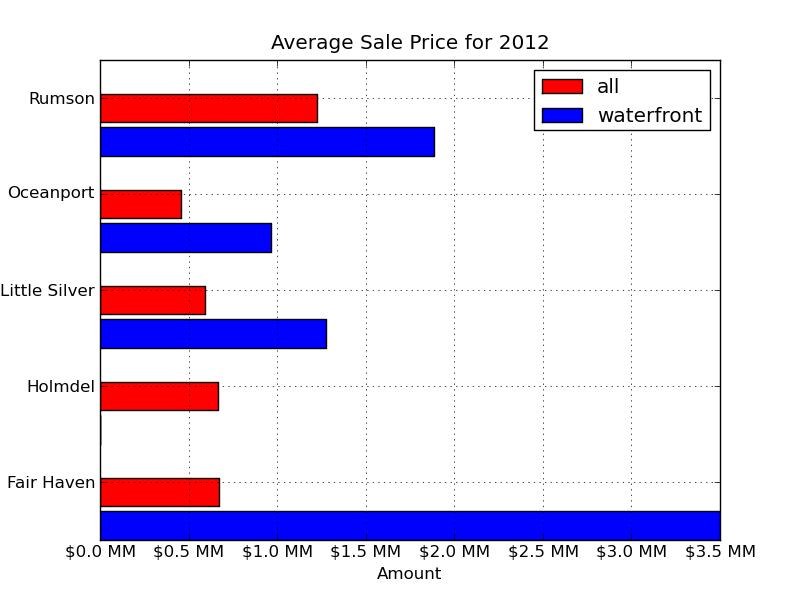 Second, the sales volume of waterfront properties is very low, only about four per year on average. Let's look at the actual numbers taken from the Ten-Year Sales Price Change, which includes ten-year changes for several groups of property classes, smoothed and non-smoothed. Wow! The smoking gun. At least that's what I thought at first and what I reported to neighbors around the time of the 28 January Borough Council meeting and discussed at the meeting. Even using the final appraisal numbers, not the inflated preliminary numbers, how can our waterfront valuation go up by 8.73% when the average sale price declined by 33.92%? Perhaps there was a problem with the simplifications I made, especially no smoothing. So I added two-year averaging and used the recording date instead of the deed date to get closer to the figures the County uses. That produced the following results. Hmmm. The smoking gun is not so smoky. A very simple, practically insignificant change produced radically different results. Here are the same graphs as above but with smoothed, fiscal-year recording date data. The assessment curve is not smoothed but differs from the above because of the fiscal year vs calendar year boundaries used to partition the data. Mouseover these for a rough (the axes aren't quite the same) comparison to the non-smoothed curves. It's starting to look like average sales figures aren't so useful. The vertical bars on the above graphs represent one standard deviation. That is, assuming a normal distribution (not a great assumption here) 68% of the sales lie within the range of the vertical bars. For at least half of the years the standard deviation is comparable to the average sale price, indicating a very large spread in the prices. So instead of looking at statistics, let's look at actual sales. In the following two graphs each dot represents an actual sale. You will find these and more including non-waterfront properties for all sales and just recent sales, which expands the last couple of years to full scale. It is now apparent why the average sale price is meaningless - the average sale price says absolutely nothing about any actual sales. It might be useful where the sale prices are tightly clustered as they are in the period around the year 2000 but for more recent sales the average is useless. This is why the small change of smoothing and fiscal year boundaries made such a big difference. 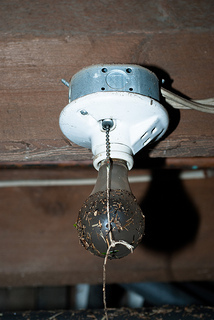 Other small changes such as adding or removing a sale or two would do likewise. And so while "waterfront properties decreased in value by 33.92% from 2003 to 2012" had a nice ring to it, especially in the context of a discussion about rising valuations, in fact it was meaningless. Moreover, any statement about average long-term change of sales price of the data at hand, while mathematically correct, is meaningless as an indication of actual sales trends and thus, as a basis for valuation. How can sales of one group of homes be used to predict the value of another group? I don't know that there is a way in all cases. In constrained circumstances where there is a similarity between the sold and the revalued properties - the homes in Alderbrook or the original Winding Way homes for example - prior sales would be a good indicator. But with the overall variance in houses in Little Silver and especially those on the waterfront are there really enough comparables for a valid valuation? With a sample only 84 sales out of approximately 2500 non-exempt properties (3.36%) overall and only 4 waterfront sales out of 100 non-exempt waterfront properties (a similar 4.00%) is there a valid statistical significance to the sales to predict the value of the whole population? I don't know the answers to these questions; I don't know if they have answers. For that reason I say that while I can find nothing in the County data to dispute the revaluation there is also insufficient data to support it. I only have assessment data for the past four years so we can't see how it changed year-by-year over the past ten years. This is of little concern as the only changes in assessed value over the past ten years should arise from substantial changes such as home additions or replacements and, of course, the recent revaluation, which is included in this four-year period. Now that the preliminary data is behind us, hopefully revised down following our individual meetings with Realty Appraisal, and we have all received our postcards, let's see what the final numbers look like. 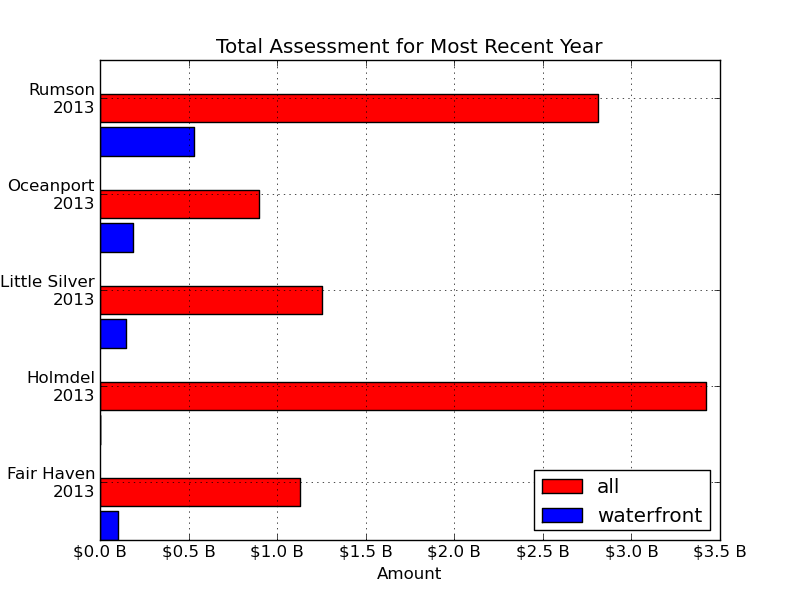 The figures below show the percentage change in land, improvements, and total assessment for each waterfront property. While the text is unreadable, I've included all three here in reduced size for a quick visual comparison. See the full-size graph and table for more detail. This is limited to just waterfront as that is of the most interest to my neighbors and me and the alternative would be unmanageably large. You'll find similar full-size graphs for land and improvements separately in the table at the end of this paper. These graphs and reports are ordered by block/lot numbers. While I've included similar charts for the neighboring towns they are all but usless as no revaluation was done in the period covered. The histograms below shows the distribution of the change in total assessment. Others for just land and improvements are linked in the table at the end. The few outlying changes exceeding +/-110% are silently reduced to +/-110%. While there are a few increases over 25%, most are not. I suspect that the outliers, 44 Rivers Edge and 41 Pine Drive, are new construction or significant renovation, and are not due to revaluation. Most importantly, there really aren't any of the huge, outrageous 60%, 70% increases that were thrown around after the late December letter. Let's look at the averages. Note the large difference between the positive land valuation, 40% for all properties, and the negative improvements valuation -17% for all properties. Tax Assessor Steve Walters advises that land and improvements "can't be bifurcated", that the only valid number is the total assessment, the one shown in the right-hand figure, and that the separation of the total into land and improvements arose as an "administrative remedy" from tax courts. Don't shoot the messenger - I'm only repeating what he told me. Another interesting detail that I saw in my own case, but don't have comprehensive data to explore for all properties, was the shift in the distribution between land and improvements from the December figures to the final ones. My improvements went from 6.53% of the land in the December letter up to 13.39% of land in the official notice arising from a increase in improvements value by 53% and a decrease in land value by 25%. I don't know why this happened, if my shift was an isolated instance, or if all adjustments were similar. If the latter then it was beneficial to the residents with a significant loss to their improvements from Hurricane Sandy as it reduced their taxes further during the recovery period. The changes other than 2012 to 2013 really aren't interesting but I've included them for a comparison with non-revaluation years. Note that property class 1 is vacant land, 2 is residential, and 3 is regular farm. The total averages show that the assessed values have not increased anywhere near the anecdotal figures from late December. The above data is taken from Analysis of Mod-IV Data, which also includes some overall statistics about the file, a list of the top ten properties overall and waterfront, and a list of properties that had a building assessment in 2012 but not in 2013. 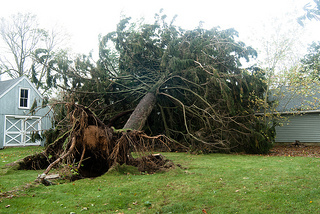 These lost building assessments may be due to demolition following Hurricane Sandy or planned rebuilds. Besides the graphs already shown I generated several others in the course of this study. These are mostly eye candy but you might find them interesting, especially in comparison with our neighbors. The full set including the ones here, those above, and more is linked in the table below. The above figure show sales in all of the years in the SR-1a file, 1995 to 2013, not at all useful to see the distribution in individual years. The following two figures are similar to the above but with a histogram for each year. 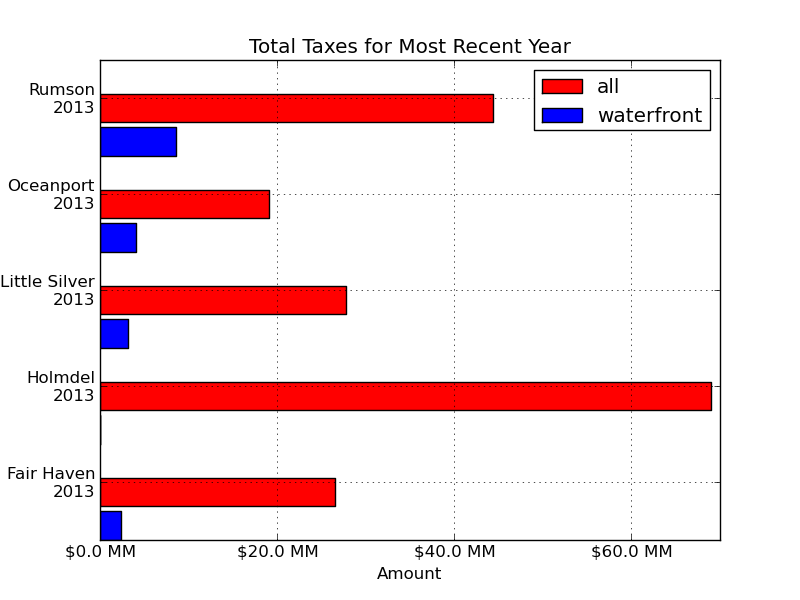 Because the total number of sales per year, especially so for the waterfront, is so much smaller than for all years the horizontal resolution is much lower. Viewed at a distance, these figures, especially the top one, help visualize the trend in sale prices. I generated several pie charts showing the mix of assessment and sales for all property classes and the same excluding residential since that dominates the chart and hides small differences in the other classes. The labels on most of the charts are unreadable because of clustering near small segments so I'll just include one here. The rest are linked in the table below. Here are a few samples of data from the text reports. The full reports are linked in the table below. I was concerned about the sensitivity of the results to the mix of property classes included. I used vacant land, residential, and farm and exclude commercial for most of the work since those classes match the typical residential situation. But I also used all non-exempt classes for some parts where I wanted to match the County practice. This report shows that non-residential sales constitute a very small fraction of total sales and would have a very small impact on the results. The remaining graphs show how the figures for Little Silver compare to our neighbor's. 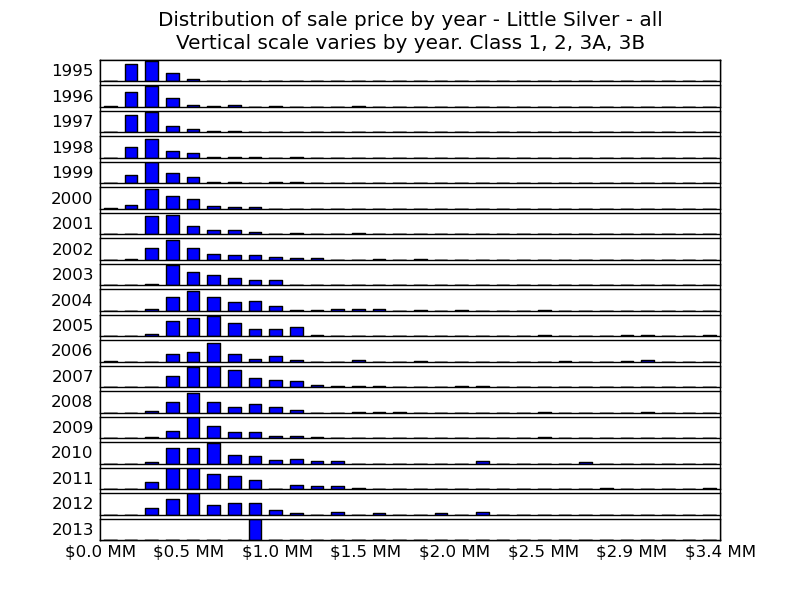 I found nothing in the County data to refute the 2012 Little Silver revaluation. I found insufficient data in the County data to support it because of the high variance in the sales price and low number of sales. Further study of the variation in the change in valuations would be interesting. The final increases in assessment were far less than the preliminary and may show a shift in allocation from land to improvements. I have long held the opinion that a fair-market property tax is inequitable. Income and sales tax are both related to the ability of the person being taxed to pay the tax. If I earn an extra dollar then I have the ability to pay some of that dollar in income tax. If I spend a dollar then I probably have the ability to spend a little more in sales tax (qualified by non-discretionary spending). With a fair-market property tax the amount of the tax is determined, not by my ability to pay, but by the willingness of someone else to pay. That I should be taxed, not on my own ability to pay, but on someone else's willingness to pay, is grossly unfair. That there is so much uncertainty in estimating the fair-market value of a home from recent sales adds to the inequity. My email address is below, which is an image to reduce spam.